How does the strength of a square tube depend on the side size? There are two square tubes of the same length, material and wall thickness, one being 40x40mm, the other 20x20mm. How does their strength against bending compare? On the one hand, the cross-sectional area of the 40mm tube is 4 times bigger. On the other hand, I guess it is mostly the two walls that are in the same plane as the bending force that work against it. The other two walls provide very little resistance comparing to the first two. And because the surface of the "working" walls of the 40mm tube is twice as much bigger as those of the 20mm one, I am inclined to think that the 40mm tube is roughly twice as much stronger. How does this conclusion stand? I am looking at using them as two or more horizontal beams 2.4m long which will take some evenly distributed load. The vertical space is limited so that I would rather use four/eight/sixteen 20mm tubes than two 40mm ones. But how many 20mm tubes would be roughly equal to two 40mm ones? Flexural capacity is based on the stress at the extreme fiber (the point farthest vertically from the neutral axis). So the relative capacity of the tubes will be a function of their section moduli. 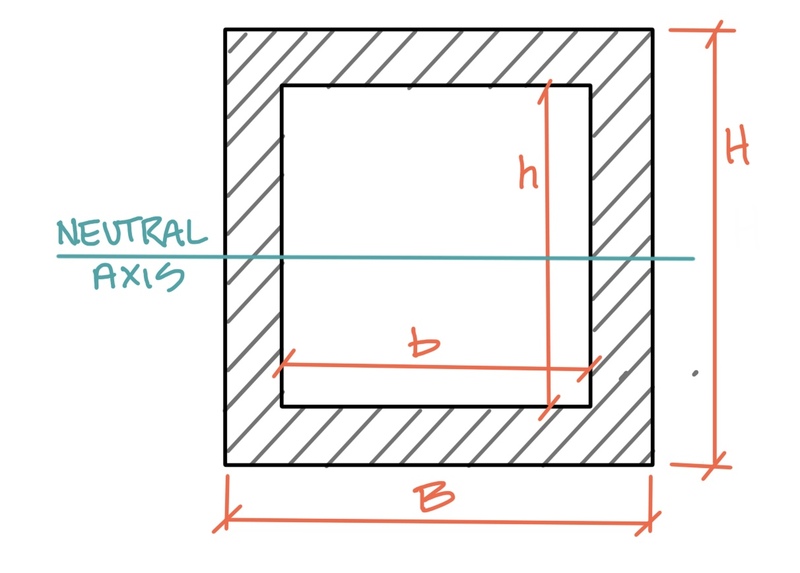 The second moment area of a hollow square section, I, can be calculated by subtracting the I of hole from the I of square. We call the outer side ,a and inner side b. So roughly, you need three of the smaller size beams for each 40x40 mm. But since the deflection of the smaller beam will be THREE times more under the same load, we need to check on that not to become too excessive. Contrary to popular opinion, the smaller tubes will provide greater strength under load than the larger tubes. Here's why: Four 20x20mm tubes have a greater cross sectional surface area than a single 40×40mm tube. In fact, the 20×20 occupy the same external volume but have treble the strength according to the physical size. This issue is directly related to the square-cube law. Because the work of fracture required to cause structural failure in all 4 of the 20×20 tubes is higher, it is therefore more reliable. If the 4 20×20 tubes are spot welded together, their structural strength may be decreased but the rigidity of the whole resultant 40×40 tube will be 3 times stronger because of the internal cross of material measuring 3.2mm thick in the shape of a "+". Obviously the 40×40mm tube does not have that rigidity or ability to resist deflection as well as 4 20×20mm tubes welded together as a 40×40mm tube. Another advantage of the 20×20mm is their ability to resist torsion better when welded together as a box tube. Not the answer you're looking for? Browse other questions tagged structural-engineering materials steel strength or ask your own question. Why is the Poisson's ratio for isotropic 1/4 and the maximum value 1/2 (when there is no net volume change)? Do beams in a structure transmit to piers? Does a joist have to lay “thin side” down? “The monofilament wire has a tensile strength of 18 kg” What does this mean? How to determine tensile strength while the normalised tensile strength is known? How do I relate Grab Strength and Grab Tear to the real world?